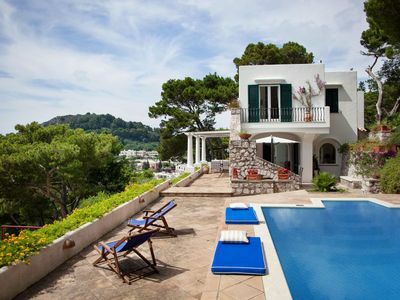 The villa stands sheer above the sea on the Amalfi Coast, with private grounds of 1500 sq.m. 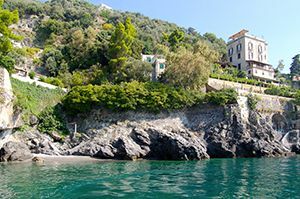 of terraced gardens descending slowly down to the sea in the delightful private inlet in the cliffs below. 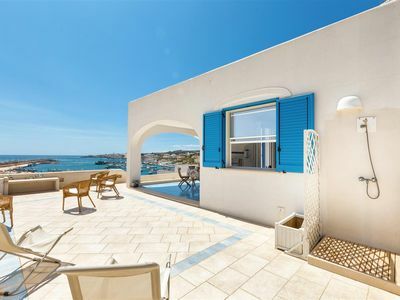 The villa is on four floors connected by a stairway, with vaulted ceilings and panoramic arched windows framing the view of the sea. 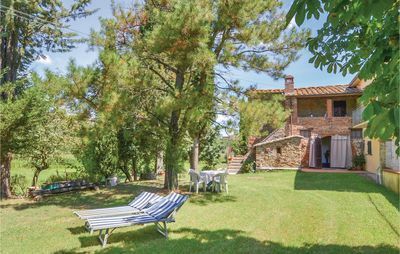 Everywhere in the house there are spectacular views and the whole villa enjoys the special atmosphere of high-quality old houses with original terracotta floors, antique parquet and old handmade ceramics. 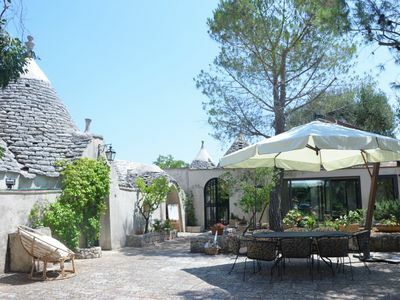 During the recent renovation it was equipped with the most technologically advanced comforts; the furnishings are elegant and antique, and all of the rooms are decorated with objets d'art, valuable paintings and precious materials. 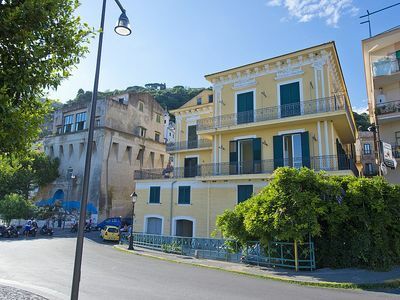 The eight large bedrooms for guests consist of six double bedrooms with another two that can be converted, on request, into twins, and have comfortable small living-areas, along with balconies or windows that open onto the wonderful view of the sea along the Amalfi Coast. 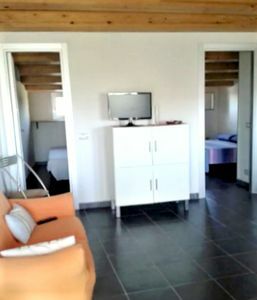 All have a bathroom in the bedroom decorated with glass mosaics, large shower with hydromassage or bathtub with jacuzzi and hairdryer, independent air-conditioning, satellite Lcd TV, internet Ethernet, minibar and safe-deposit box. 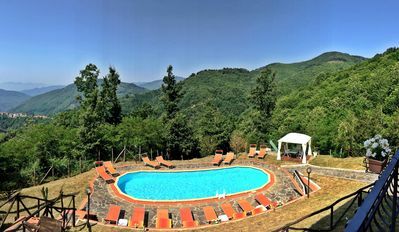 On the terrace above the villa is the very panoramic, furnished roof garden of about 100 sq.m., with its own small kitchen and barbecue, ideal for organising romantic candlelit dinners with a view of the whole of the Amalfi Coast, which in the summer is dotted with the lights of the villages, of the night fishing boats and fireworks. At the foot of the villa is another large, flowering terrace with a view of the sea, completely covered with a pergola of bouganvillea. 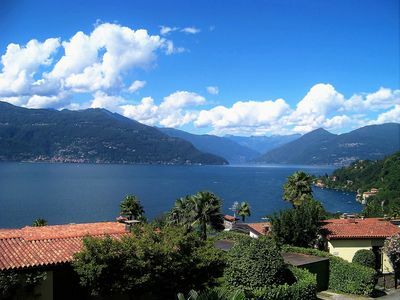 The property has private access to the sea: 130 steps down through terraces of bouganvillea and citrus gardens to the furnishinged sunbathing areas, the meadow with natural grottoes, the panoramic belvedere with a small swimming-pool of about 8 sq.m. with hydromassage and further down a small private landing-stage with sunbathing area in the delightful inlet in the cliffs below. 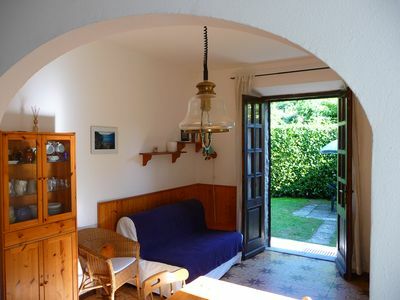 The villa lies about 1 km from Amalfi and 5 kms from Ravello. 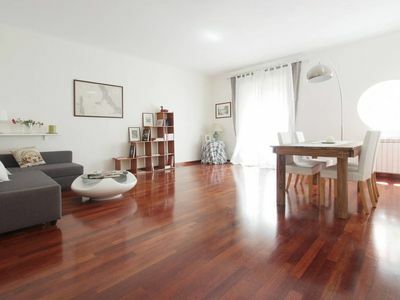 on the SECOND FLOOR, another 3 double bedrooms with bathroom with large oval windows framing wonderful panoramas. 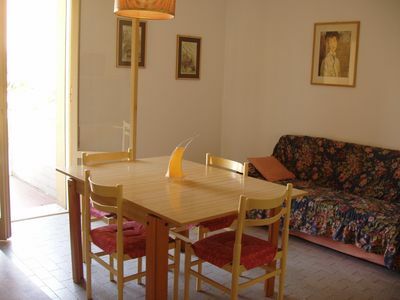 In the GARDEN LEVEL FLOOR BELOW, reached by the staircase, another large corridor, characterized by rock walls, leads to the dining room, furnished with a nice antique table which can be lengthened if needed, and to a living area with 40" Lcd TV; and then on to the large, well-equipped kitchen, with a central island and to the laundry area with dishwasher and drying machine. 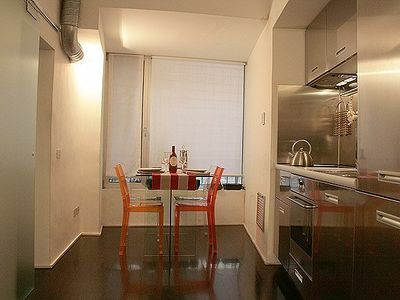 The whole of this floor is connected with a terrace with a terrific view of about 60 sq.m. covered like a patio, which in the summer months becomes a open-air dining and living-room. 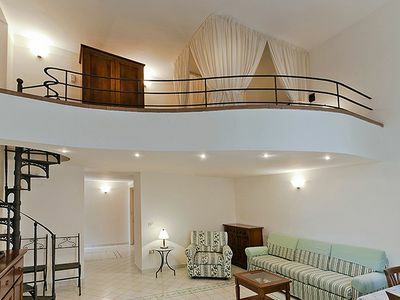 From a large loft looking onto the dining area, with a view of the sea, you come to a wonderfully romantic double bedroom with living area, equipped with its own large bathroom and a convenient wardrobe cabin. 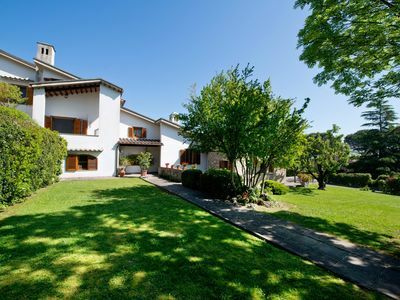 This is a beautiful 8 bedroom property located in Campania, Italy. 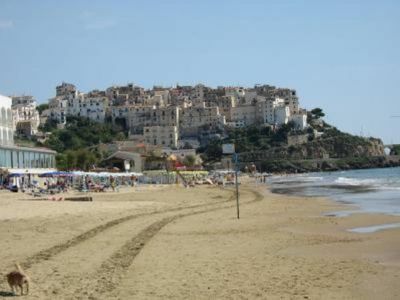 This villa, in Castiglione, boasts a gorgeous sea view sleeping 16 people. 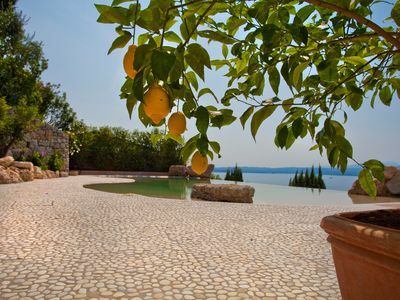 The villa offers superb accommodation, including modern luxuries such as a swimming pool (2m x 4m), internet access, television, DVD player and air conditioning. A security deposit of £3000 is required for this rental. 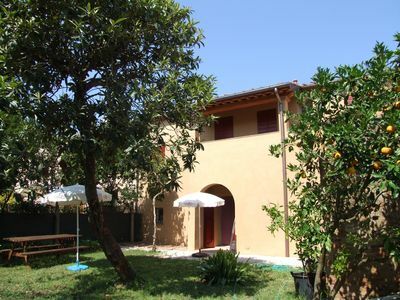 Private villa close to Certaldo and San Gimignano with pool and large garden. 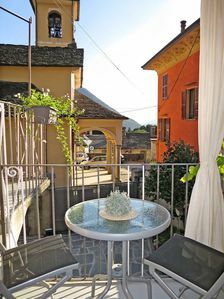 Casa al Ponte apartment with private garden, Internet Wifi!